Since Monday we’ve been offering 10% off at the Joan Allen Online Store. This discount applies to all products that we offer and all you need to do is quote the discount code “EASTER10”. 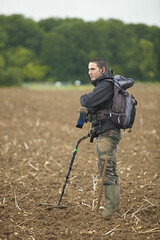 We currently have a variety of special offers available on a variety of detectors, which is in addition to our usual selection of Minelab, Bounty Hunter, Viking, Fisher, Laser detectors, as well as our own brand. We have recently taken in quite a few second hand detectors and accessories that are available for purchase, although the list on the website is not always extensive so get in touch for what we currently have in stock. We also offer a wide range of accessories including clothing, probes, digging tools and headphones. For more information on any of these products or this offer, please contact us on 01959 571 255. February 2013 has drawn to a close, and as such we’re looking back on the best metal detecting finds from the Joan Allen community. Our followers and fans keep sharing their finds on Facebook and on Twitter – and we keep sharing them on our blog! Make sure your sharing yours too and you could feature in March’s review!